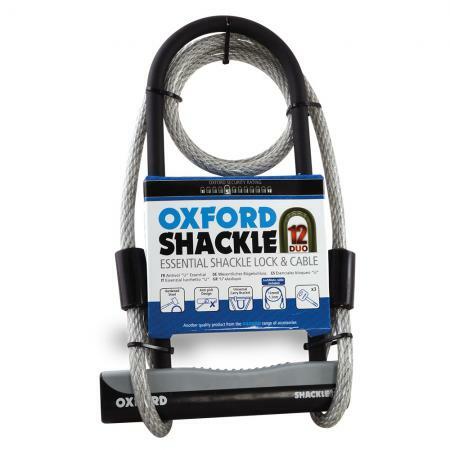 The Shackle 12 Duo D-Lock (also known as a U-Lock) from Oxford Products is a bigger version of the standard Shackle 12. Upgraded to 330mm x 190mm it features the same 12mm diameter hardened steel construction and pick resistant tumbler as the standard Shackle 12 and also comes with three keys. Included with the Shackle 12 Duo is the LockMate 12, a 1.2m long 12mm diameter braided steel cable with loops on each end. 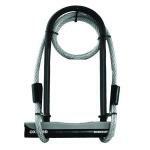 This additional cable can be looped through your bikes wheels or frame, or whatever you are locking your bike to.